Because many of you attend paper exhibits around the world, I'm guessing you will enjoy hearing about Bag It! 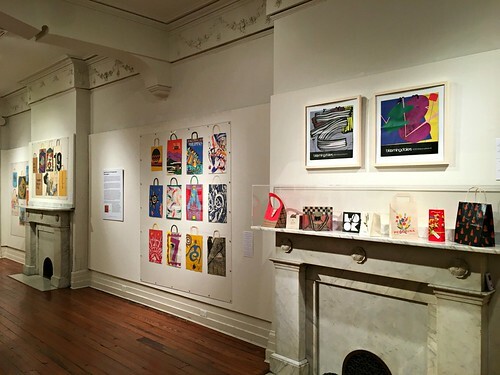 The Art of the Shopping Bag, a small, but interesting feature that is underway at the Lancaster Museum of Art in Lancaster, Pennsylvania. Yes, the simple focus is shopping bags... those ubiquitous parcel carriers (and walking advertisements) we all know and appreciate. Perhaps a few of the examples in these photos are etched into your childhood memories as they are in mine, or you can at least relate to the heady experience of toting a long-coveted item in a crisp shopping bag... packaging has a way of making a purchase seem even more special. 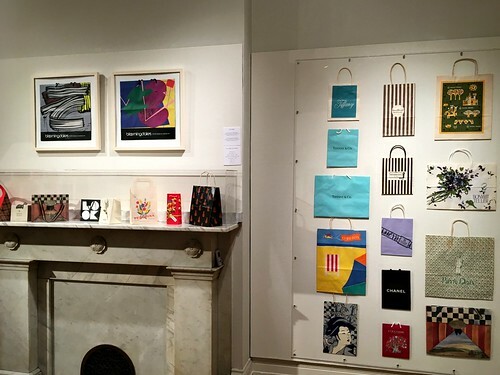 From the museum's press release, the exhibit focuses on the graphic nature of shopping bags and gives insight "into their rise as a utilitarian item that evolved into a status symbol for shoppers and merchants." Serving as lasting souvenirs of trips and purchases, "they come in diverse colors, sizes, and designs all intended to catch the attention of the public. These bags are from a time when merchants saw the value in their creating a brand and eventually commissioned artists to design them." The 150 bags on display are only a sampling from a collection of more than 1500, gathered by museum board member and widely traveled Lancaster resident Jean Gromell. 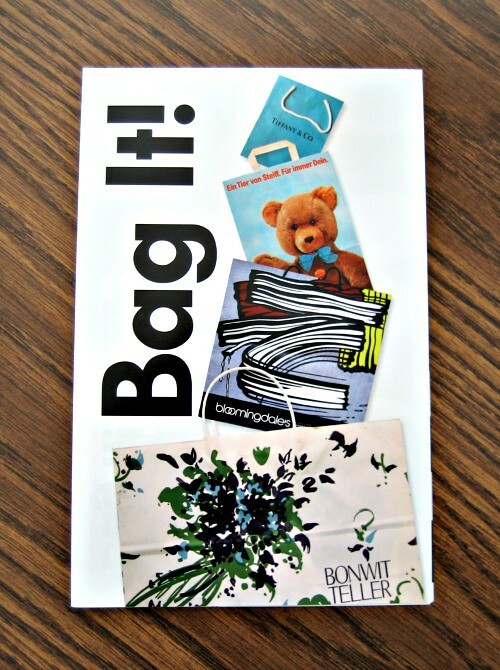 Bloomingdale's bags, including one that featured the art of Roy Lichtenstein (as seen in the image above the mantel on the left), are well-represented, as are bags from other department stores, museum shops, bookstores, and local Lancaster merchants. The exhibit can be viewed daily (except Mondays) through June 25, 2017. The Lancaster Museum of Art has an active Facebook page. Ooooo, that is really neat! So glad you let us know about this. I have a collection of over 600+ shopping bags from all over the world. They get displayed in my office. When people come in they are a bit struck. Then they bring me bags from their travels. Lancaster is a few hours away but I am definitely going to go see this exhibit. I'm so glad you all enjoyed hearing about the exhibit!